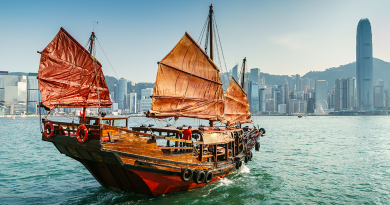 Combining fresh sea air and dashing good looks, Qingdao – the name means ‘Green Island’ – is a rare modern city that has managed to preserve some of its past while angling a dazzling modern face to the future. Its blend of concession-era and modern architecture puts China’s standard white-tile and blue-glass developments to shame. The winding cobbled streets, historic German architecture and red-capped hillside villas are captivating and there’s so much to enjoy in the city’s diverse food scene, headlined by the ubiquitous home town beer Tsingtao. Meanwhile, the seaside aspect keeps the town cooler than the inland swelter zones during summer, and slightly warmer in winter. 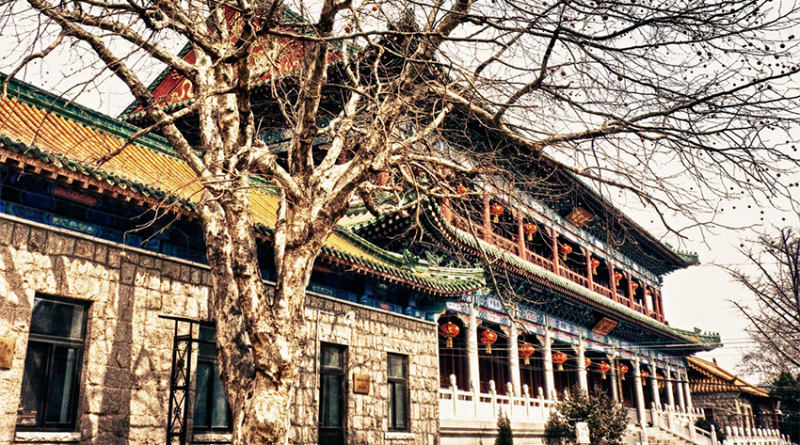 Qingdao’s Zhanshan Temple makes for a great peaceful retreat from the buzz of downtown. Zhanshan Temple is China’s youngest temple constructed within the Tiantai sect of Buddhism (China’s oldest homegrown sect of Buddhism). Construction of the main hall, several traditional style temples and the 7-tiered tower began in 1933 and was not finished until 1945. Recently, the cranes and power tools have reincarnated and several new temples and a large ostentatious bell-tower have popped up within the premises over the last years. Located near the entrance are a pair of stone lions dating back to the Ming Dynasty (1368-1644). In the early 20th century, supposedly some Germans constructing the Jiaoji Railway looted them from a wealthy landowner’s home in modern day Qingzhou (just west of Qingdao) and brought them to Qingdao. After the German colonial era they were donated to Zhanshan Temple, greatly damaged during the Cultural Revolution, and restored in the 1980’s. Grab some incense and enter through the south gate on Zhiquan Lu for a free peak of the main tower and a lotus pond containing a large Bodhisattva sculpture. If you want to get inside the temple complex it will cost you 10 RMB, and it’s open 8:00 am – 4:30 pm. Qingdao Beer Museum, which lies on the old site of the Tsingtao Brewery Company, which is a world-famous manufacturing enterprise special in brewing. German Beer Company Qingdao Branch established in 1903, China’s first brewing factory that built with European technology was the predecessor of the Tsingtao Brewery Company. At present, the museum owns 55 brewing factories and malt factories in 18 cities and provinces in China. The one-hundred-year old Tsingtao Beer has created its own history and culture. Qingdao Beer Museum is the first one of its kind in China, the construction of the museum provides a spectacular showcase for the local beer to oversea visitors, and has become the pride of the local people. In the manufacturing and technology area, the historic buildings, facilities and the original workshops and scenes of production brings the museum to life. Brewing ingredients like barley, brown malt and hops are also on display. Sculptures of staff in the workplace vividly represent the making process. The first floor of this multi-functional space can comfortably accommodate more than 100 visitors, providing both wine-tasting and shopping opportunities. Visitors can also sample the various freshly brewed beers and buy a great variety of souvenirs. With its religious position in China natural spot, Mt. Laoshan is located by the seaside of East China Sea along the coastline, about 40 kilometers from downtown Qingdao. It is called the No.1 religious mountain because Mt. Laoshan is one of the “Cradles of Taoism”. At the peak of Taoism, there were nine palaces, eight Taoist temples, and 72 nunneries that housed nearly 1,000 Taoist priests and nuns on the mountain. At present, the Taiqing Palace is the largest and oldest among the preserved Taoist establishments. The natural scenery also makes Mt. Laoshan as a perfect place for sightseeing, holidays, recreation, recuperation as well as cultural and patriotism activities. Towering cliff, deep abyss and rocks of untold shapes are so common in Laoshan that they can be seen everywhere. To top all this, the internationally – marketed Tsingtao beer is brewed using the water at Laoshan. Mt. Laoshan is known for its oddly shaped rocks, ancient trees, and crystal-clear springs. Among the most famous springs are the Tianyi Spring on the mountaintop, the Shenshui (Immortal Water) Spring in the Taiqing Palace, and the Shengshuiyang (Ocean of Holy Water) Spring in the Shangqing Palace. People say the mineral water produced here can cure chronic diseases. Laoshan District, Qingdao, Shandong Province, China. St. Michael’s Cathedral, a Catholic Protestant Church located on ZheJiang Road in Qingdao Old Town, was erected by the Divine Word Missionaries in 1934. The main entrance is centered on the south side of the building facing Qingdao Bay. The Catholic Church is imposingly and elegantly built with yellow granites and reinforced concrete, with concise and graceful patterns carved on the wall surface. Windows are of solemn and simplicity which are designed in semi-circle arch with simple lines. Above the gate is a huge rose window, and on two sides are two bell towers, on each of the red tile-covered cone spires is a 4.5-meter-high cross. Each tower is 56 meters high, with 4 bells hanging inside. Entering the church, it is a spacious hall which is 18 meters high and can hold 1000 people each time. On the corridors on two sides of the hall are two big altars and four small altars. The dome of the church is dignifiedly painted icons, and dazzling lights brimming with strong religious atmosphere. May Fourth Square is a large public square in Qingdao’s central business district. It is located between the new municipal government building and Fushan Bay and is composed of Shizhengting Square, the central square and the coastal park. Named after the nationwide protest May Fourth Movement that started in Qingdao, the square is best recognized by the large “May Wind” (Wuyue Feng) sculpture near the seaside. The square is a popular tourist destination, and is bordered by the city government to the north, the sea to the south, and residential and commercial buildings on either side. On pleasant days May Fourth Square fills with young couples on the ground and kites in the air. May 4th Square is very popular as a leisure venue amongst both locals and visitors. On pleasant days, many young couples can be seen at the square, along with children flying kites. In the southern section of the square in the Fushan Bay area, you will find China’s highest fountain. The urban area surrounding the square has developed into Qingdao’s economic, political, cultural and financial centre. You will see commercial trade centres, insurance and finance centres, as well as recreational sites. Qingdao hotels such as the Copthorne Hotel Qingdao offer easy access to these attractions.